Empire de Charlemagne VIIIe. Siecle. 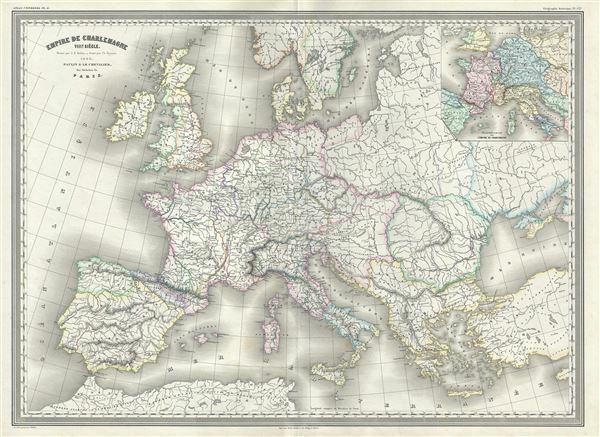 This is an uncommon 1860 elephant folio map of the Europe during the Empire of Charlemagne issued by A. H. Dufour. The map covers Europe and the European Empire of Charles the Great from southern Sweden and Norway to Italy and Spain. It also includes the United Kingdom, Ireland, Germany, Austria, Romania, Denmark, France, Greece, Italy, the Balkans, Spain and Portugal. An inset in the top right quadrant depicts the Dismemberment of the Empire of Charlemagne. Throughout, the map identifies various cities, towns, rivers and assortment of additional topographical details. After ruling and reforming France in 768, Charlemagne conquered Italy and, in 800, was crowned Holy Roman Emperor. For the next 14 years until his death, Charlemagne's Empire united much of Western and Central Europe for the first time since the collapse of the Roman Empire. The ‘Carolingian Renaissance' witnessed a Catholic themed revival of art, religion, and culture, encouraging the formation of a common European identity. This map was prepared by Auguste-Henri Dufour and engraved by Charles Dyonette for publication plate no. 1ere. in Armand Le Chevalier's 1860 edition of Atlas Universel, Physique, Historique et Politique de Geographie Ancienne et Moderne.